Yesterday was Dominican Republican Independence Day. I started my day with a walk to other side of the resort ... I've been spending my time in our adults section and the middle general section so it was interesting to see the other side. I met a cute cat who yelled at me. I headed for the beach and ended up on the other side from where Sister Sarah and I usually sit on the adult side. This dog had been hanging around the show Tuesday night and caught everyone's attention. It was so still but I did see that it was breathing. Sister Sarah and I started our day at the beach. The water was cool and wavy at first but refreshing once we got used to it. After lunch at the beach bar, we moved to the adults pool for a while. During the week, you can make reservations at three of the à la carte. We had supper at the Mexican restaurant. I will admit that I went in with low expectations and was pleasantly surprised that our food was pretty good. The entertainment tonight was in celebration of Dominican Republic Independence Day, which is today. I started my day at the beach. I didn't go in the water but read on a lounger for a couple hours. I had lunch at the main buffet and ran into Sister Sarah late this afternoon at the adults pool where I was reading and relaxing. We had supper at the main buffet and then headed to the show, which had a retro theme. The band sang songs from the 1950s to the 1980s. Sister Sarah and I spent the morning at the beach ... there is lots to see! Vendors are continuously walking up and down the beach trying to convince you to buy something. Sister Sarah and I found each other in the lobby this morning. I gave her a quick tour of the resort and then we went for celebratory piña colada in the VIP lounge. Diego, our bartender, was fun and gave us some shooters along with a couple mystery drinks. We went for lunch and then headed to the beach. 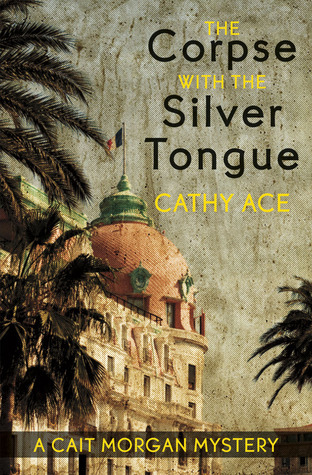 From Goodreads ~ In the south of France where hatred simmers in the heat, a man seemingly admired, and certainly feared, drops dead at a dinner party. All of the guests fall under suspicion, including Welsh-Canadian professor Cait Morgan. A criminologist who specializes in profiling victims, Cait sets out to solve the murder - and clear her name. Add to this the disappearance of an ancient Celtic gold collar said to be cursed and there you have the ingredients for a Nicoise salad of death, secrets, and lies. Will Cait find the killer before she, too, falls victim to a murderer driven by a surprising and disturbing motive? Cait is a criminologist from Vancouver, BC, in the south of France to present a paper for a colleague. She runs into a former boss, Alistair, who invites her to his birthday party that evening. Despite the fact that she hates him, she can't say no. That night at the party, everyone falls ill (it's discovered they have been poisoned) and Alistair dies, and an expensive historical necklace Alistair was going to give his wife disappears. Those at the party are under suspicion ... Alistair's young flaky wife, the novelist who lists upstairs, a couple of elderly neighbours, an museum director and even Cait. It gets more suspicious when another attendee of the party is found dead. This is the first book I've read by this author and I liked it. It is written in first person perspective in Cait's voice. I liked that Cait wasn't perfect ... she was 48-years-old, shorter than average, overweight with greying hair who usually wears "black bouncy, draper layers that suits most occasions and which never ever creases". She wears horizontal stripes because though they say they make you look wider, jokingly believes that people will think it's the stripes that making her look twenty pounds heavier. She enjoys her own company and isn't a joiner. I thought the story was interesting. I wasn't crazy about the ending, though ... I didn't find her potential love interest believable at that point. This book is the first in the Cait Morgan mystery series and I look forward to reading the others. Sister Sarah and I are on our annual sisters week away. This year we are in Punta Cana. I arrived about 1pm and by the time I got through customs and got to the hotel, it was a couple hours later. Sister Sarah was supposed to be here an hour ahead of me from Halifax ... but there was a mechanical issue with her plane and she arrived 13 hours late at 1am! After checking in and walking around the resort to get my bearings, I had a couple drinks on the patio off the lobby and read for a bit. Needless to say, it was nice and warm. I spent the last two nights at the Comfort Inn in London ... the hotel where I usually stay when I'm in London must have been heavily booked because nightly rate for the existing rooms was crazy ($500/night). So I stayed at the Comfort Inn instead at about $100/night. I had supper this evening at Tony Roma's. I ordered a half rack of baby back ribs with Carolina Honeys sauce. I passed on the coleslaw and they gave me extra garlic mashed potatoes. The ribs were okay, not great. I expected more since they were "world famous". They weren't overly tender and it would have been nice to have a steak knife rather than a butter knife to cut them. The sauce was good. The mashed potatoes were the best part of the meal (there was a lot) and I couldn't finished them. I had lunch today at the Spare Parts Diner. I got there right at noon and it was a busy spot so I sat at the bar. My favourite Broken Lasagna is now off the menu (boo!) so Nicole, my server, suggested the new Hungry Carnivore. It sounded good to me so I ordered it (but without mushrooms, peppers or parmesan). It was really good! Thanks for recommendation, Nicole! It's a big meal and I couldn't eat it all and ended up taking half of it back to my hotel room. I'd get it again.